Banks and post offices pay a nominal interest on the balance in SB accounts. The interest % varies from time to time. In the case of Banks it used to be fixed by Reserve Bank of India and hence it was uniform for all Banks. Now banks are free to decide their own interest rates on SB accounts and it varies from 4%. Some banks pay as high as 7% In the case of Post Office, interest% is fixed by Finance Department of Government of India. It has been 3.5% for many years. In the case of Post Offices, the interest is calculated on the basis of monthly minimum balance maintained between 10th and the last day of each month. However, from April 2010, Banks are calculating SB interest on balance held at the end of every day. In the case of Banks the interest is calculated monthly but credited to the SB account quarterly or half yearly. Effective from April 2010, in the banks, SB interest is paid on Rs 71,700 for one day, as if this amount is in the account for only one day. The balance for April 2015 on all the days of the month be 2000. The balance for May 2015 all the days of the month be 2400. The balance for June 2015 all the days of the month be 1600. ‘Daily Product’ is defined as the balance at the end of each day. 'Product' is balance at the end of the day* Number of days that balance is held. Let us find now the product for the three months starting from April 2015. Up to 8th balance was 1500. This amount of SB interest was correctly credited by the bank to the account on 1st July 2015, From July onwards; the SB interest credited to the account is also included for monthly SB interest calculation. 2. Similarly interest earned on a deposit of Rs5, 000 for 12 months is equal to interest earned on a deposit of Rs.60, 000(=5000*12) for one month. In post offices also the method of calculating SB interest is same as in Banks but the interest is credited only once a year on 1st of April. The monthly minimum balance in Post office is called ‘Interest bearing balance’ which is the lowest of daily balances between 10th and the last day of any month. 4.6.2 Problem 1 : Madhuri has a post office SB account. The following are extracts of her pass book. Find out the interest which gets credited to her account on 01/04/2000 if rate of SB interest is 4%. What do people do when they receive large amount of money (on retiring from service, on sale of property, .). In some cases they may need that money at a later stage for buying of property. In such cases people normally invest such an amount in Banks for a longer period. In this scheme a fixed amount is invested for a fixed period. The interest is paid at the end of the maturity period along with initial deposit. This scheme is suitable for those who need money after some time (buying property). The period is normally for few years. The depositor needs to make an application to bank. 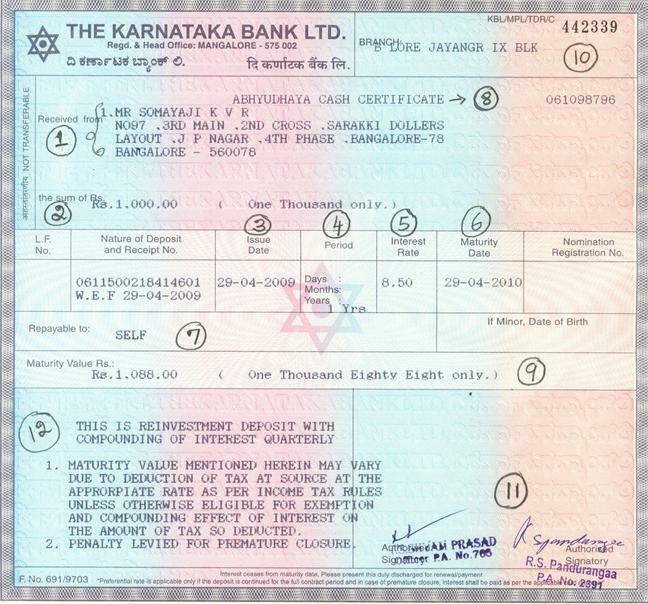 On payment of initial deposit bank issues a certificate to the deposit holder. In effect in this scheme the depositor gets interest on interest (called compound interest). The depositor needs to make an application to bank. On payment of initial deposit bank issues a certificate to the deposit holder which is similar to format of CTD. Banks use a Ready Reckoner to find the amount payable at the end of maturity period. The Ready Reckoner for repayment amount for few months (6,12,24,36) for different Interest rates(6,8,10) for a monthly installment amount Rs 100 is given below. Where P is installment amount per month. N = Number of months for which RD is opened, R= Rate of interest per month. 4.6.3 Problem 1 : If Nanda saves every month 50 Rupees for three years, find out how much she gets at the end of three years @ 8% interest and also the interest part in that amount. Hence at the end of 36 months she will receive Rs. 4077.15. What was the sum of all her monthly installments? Total interest received = Amount received on maturity – Sum of monthly installments = 2038.58-1800 = 238.58. 2. The interest % increases with the increase in period of deposit. The interest % offered by various banks is almost same. You can visit the internet sites of the banks to know the applicable interest % for various periods at any time. When banks collect deposits from public they need to find a way for disbursement (payments) of large amount of money with them. This they do so by giving loans to individuals, companies, businessmen. Like the way banks give interest to depositors on deposits, they collect interest from borrowers of loans. These are loans repayable on demand. The borrower executes an agreement with the bank, promising the Bank to repay the loan at the end of loan period. Normally loan period is of short duration less than 3 years. This type of loan is availed by individuals and ???? These are similar to demand loans with the difference that term of loan is more than 36 months. This type of loan is availed by individuals and ??? In the case of above two types of loans, interest is calculated on the loan outstanding on a monthly balance basis. Interest is collected (debited) quarterly. Banks calculate daily products and on the sum of these daily products, they find the interest. This is strictly is not a loan but a financial arrangement of borrowing of amount for few days at a time. In this type of arrangement the current account holder is allowed by the bank to draw more than the balance amount in his account. The borrower and the bank agree on a upper limit. The borrower can not draw more than this limit. Overdraft facility is used mostly by traders and small businessmen when they need extra money for a short period. 4.6.3 Problem 2: A person has taken a loan 1,00,000 on 15/1/01 at 12% He repays 25,000 on 18/2/01 and Rs 10,000 on 16/03/01 and 40,000 on 28/4/01. The loan was closed on 16/5/01. Calculate the interest compounded quarterly. Since the interest is compounded quarterly, we need to calculate the interest up to the calendar quarter ending 31/03/01. Balance increased by interest of Rs 2100.